GradeBeam is a cloud-based communication network designed for construction professionals, in order to enhance their communication with their fellow team members, superiors, and clients. Designed and built by veterans in the construction industry, Gradebeam allows users to have a secure project communication channel where they can store documents, exchange project information, discuss project-related matters and more. GradeBeam is aimed towards General Contractors, Subcontractors, Suppliers and Distributors, and even Associations of Construction professionals. With GradeBeam General Contractors save time, money and paper overhead and can fate their subcontractors accurately. The system also provides market capabilities for subcontractors, who can leverage GradeBeam to access online documents and receive private opportunities. With GradeBeam, users enjoy fast, simple, and highly accelerated exchange of massive amounts of project data that happens in many critical stages of a project, including, pre-construction phases of projects, like Invitations-To-Bid (ITBs), drawing/specification distribution, corrections, addenda, RFIs, and responses. GradeBeam is also designed to work with the latest communication and sharing technologies, allowing construction professionals, from general contractors, subcontractors, to printers to easily connect, communicate, and perform their tasks efficiently. The cloud-based system also promotes transparency, accountability, and consistency. Thus, delays are diminished and project expenses are greatly lowered. Armed with the latest in information and communication technologies, GradeBeam allows industry professionals to accelerate work processes, save significant time and greatly reduce their project expenses and turning their workflows into more cost effective processes. GradeBeam enables quick and easy sharing of project plan while management of of bid documents and addendum notifications becomes more simplified and centralized. Keeping you project team members connected is also a breeze as well as keeping them updated with real time information. This means drastically improved productivity for all team members while you save time tracking down documents. Businesses greatly benefit from integrations with BidOrganizer® and PQM™, applications that help manage your invitation to bid process as well as changes throughout the construction bidding process. If you are interested in GradeBeam it may also be beneficial to analyze other subcategories of Best Construction Management Software gathered in our base of SaaS software reviews. Organizations have unique needs and requirements and no software solution can be just right in such a situation. It is futile to try to find an ideal out-of-the-box software product that fulfills all your business wants. The smart thing to do would be to customize the system for your specific requirements, employee skill levels, finances, and other factors. For these reasons, do not hurry and pay for well-publicized leading systems. Though these may be widely used, they may not be the perfect fit for your particular wants. Do your groundwork, look into each short-listed platform in detail, read a few GradeBeam reviews, contact the maker for clarifications, and finally choose the product that presents what you require. How Much Does GradeBeam Cost? We realize that when you make a decision to buy Construction Management Software it’s important not only to see how experts evaluate it in their reviews, but also to find out if the real people and companies that buy it are actually satisfied with the product. That’s why we’ve created our behavior-based Customer Satisfaction Algorithm™ that gathers customer reviews, comments and GradeBeam reviews across a wide range of social media sites. The data is then presented in an easy to digest form showing how many people had positive and negative experience with GradeBeam. With that information at hand you should be equipped to make an informed buying decision that you won’t regret. What are GradeBeam pricing details? What integrations are available for GradeBeam? 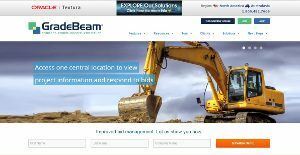 If you need more information about GradeBeam or you simply have a question let us know what you need and we’ll forward your request directly to the vendor.